The Imixs-Workflow engine provides an administration process called AdminP. This service schedules so called AdminP Jobs. An AdminP job can be used to process documents and process instances in a batch processing. The AdminP process can also be monitored by the Admin Client Tool. The Imixs-Workflow engine provides a set of standard AdminP Job Handlers which can be triggered directly form the Rest API or the Admin Client Tool. 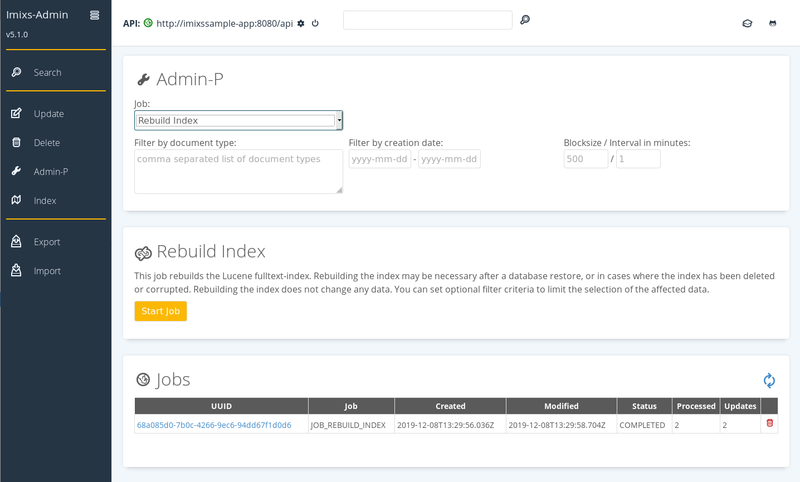 With the function ‘Rebuild Index’ the lucene index can be updated. After the job is started the existing documents will be re-indexed. The blocksize defines the maximum number of workflow documents to be processed in one run. After the blocksize was updated, the job will pause for a given interval specified in minutes. The item ‘typelist’ is optional to restrict the type of documents to be updated by the job. The items ‘datfrom’ and ‘datto’ are optional and can be used to restrict the update to a timerange of creation. The new userId can either be replaced with the old one or be appended. The blocksize defines the maximum number of workflow documents to be processed in one run. After the blocksize was updated, the job will pause for a given interval specified in minutes. If the job item ‘keyReplace’ is set to ‘true’ then the old user id will be removed. If a workitem has the item ’private" set to true the workitem will be ignored by the job. This is useful for personal workitems which should not be delegated to the deputy. E.g. ‘personnel file’ or a ‘application for leave’. The administration process provides a feature to upgrade exsiting workitems to the latest version of Imixs-Workflow . This feature can be used to synchronize a workflow instance with the current engien version. An application can provide custom AdminP jobs. An AminP job must implement the interface ‘org.imixs.workflow.engine.adminp.JobHandler’. The JobHandler is injected by CDI. This means that the custom implementation must be an plain java bean and no EJB service. The AdminP Service calls the run method of the custom JobHandler and provides the job description in an ItemCollection object. The JobHandler must return the job description with the predefined field isCompleted to signal the current status. If the field isCompleted is set to true, the AdminP Service will terminate the Job. Otherwise the AdminPServcie will wait for the next timeout to call the run method again. // more work to do? To start the JobHandler via the AdminP Service interface the attriubte ‘job’ must be set to the class name of the CDI Bean.